It’s hard to believe that it was 98-years ago today that Uncle Billy was born, in 1913. How times have changed? To mark his special occasion, he didn’t want too much fuss, so a trip to Nandos it was – obviously with some brandy in-tow. With one thing and another, I’ve not had time to write my usual blogs about Uncle Billy, but endeavour to do this soon with his wise words of wisdom. I can tell you though that… recently he had a ‘late-life’ crisis… we painted and recarpeted his home ‘after’ 27-years (for real). Well, someone else did it, and we watched. Uncle B’s home was fine as it was, but we thought we’d update the 1984 work. The funny thing is that, he chose the same colour for both his walls and carpets as he’d previously had, for all those years! 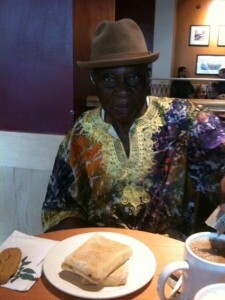 I think that’s the trick for old age (apart from the cod liver oil he tells me he takes), is to not ‘change’ too much. If it’s not broken, why fix it? Today has been a special day for Uncle B, surrounded by those who love him and whom he cares for. I have no doubt that we all look forward to his next birthday, and him receiving his card off Her Majesty at 100. 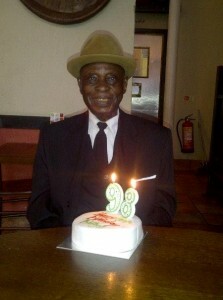 Happy ’98th’ Birthday Uncle Billy!